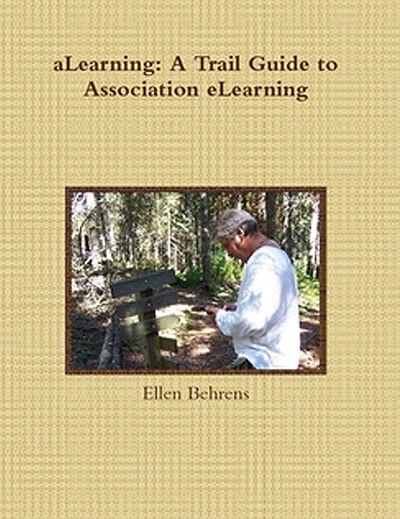 Though I’d thought it was time to retire aLearning: A Trail Guide for Association eLearning, I continue to see sales and interest in the book — a great sign that online learning is alive and well and growing in the world of nonprofit and trade associations! Much has changed in the technology of elearning since the trail guide was originally published in 2009, but the step-by-step instructions for gathering what you need to develop, and then create, your association’s elearning strategy are still valid. When the book came out, it was the only place to get such detailed information in a practical, useful format. Whether your online learning strategy needs an overhaul or you’re just getting started, the aLearning trail guide can help. And that help is easier to get than ever. While I still believe the book is best used in print format, those who’d prefer a copy on their Kindle or other device can now purchase and download it. And the e-book can be given as a gift: with a few clicks, you can purchase it and have it sent to someone else via their e-mail address. How cool is that? Order now, for just $9.99. We’ll call it a technological earthquake (because we’re currently in Soutern California; you can call it a tornado or hurricane or monsoon… whatever). The article identifies some key takeaways from their work. Despite its popularity, social networking suffers from just a 14% confidence rate. According to Jeffrey I. Cole, Director of the Center for Digital Future, “…51% of users said that only a small portion or none of the information they see on social networking sites is reliable.” Yep. Makes you wonder: how credible do people think your association’s Facebook presence is? What can you do to improve their confidence in your social networking presence? The desktop PC is going to dwindle to 4-6% of computer users — and those will primarily be professionals who rely on computers for their work (programmers, financial planners, scientists, writers, gamers, analysts, and scientists). Tablets will soon become the most used personal computing devices because they are “more convenient and accessible than laptops and much more engaging to use.” Are you preparing for this shift? And, as you know I like to warn, do your members fit into the tablet profile, or are they in a field that will be in the minority but devoted group of desktop PC users? Because it won’t matter if 96% of the country is using tablets if 98% of your members are still using desktop PCs and/or laptops. Just sayin’. The irony about personal computing is that we believed they would be labor-saving devices — and they are — but they have also extended the workday into the evening and expanded the workweek into the weekend. Many people on vacations stay tethered to the office via e-mail, Twitter, and other methods. So here’s what you should be asking about your online offerings: are you making it worth your members’ time to participate in your Webinars, social networking discussions, online courses, and otherwise engage in the online activities you make available to them? Better make sure. The report suggests that people are soon going to have had it with all this and start cutting back. Don’t give your members reasons to cut you out. With the exception of four major newspapers (the NY Times, USA Today, Washington Post, and the Wall Street Journal), Sunday metros and small weeklies, most US print newspapers will be gone in five years. The report asks, “How will the changing delivery of content affect the quality and depth of journalism?” What opportunities for you does this open up? How can your organization make up for any lost quality or depth of journalism? Where are the gaps that you can fill? How transparent are you? How do you reassure your members that their online presence with you is safe? “Our latest Digital Future study found that almost half of users age 16 and older are worried about companies checking what they do online; by comparison, 38% said that the government checking on them is a concern,” says Cole. While our members love making purchases and connecting with others online, they’re also very aware that the Web is public, and that information on them is collected with nearly every click. So far that isn’t stopping people from participating in online shopping, surveys, commenting on blogs, reviewing purchase experiences, adding rankings and ratings, etc…. But what are you doing to make sure your members don’t log off your site or your blog or move away from your Facebook or LinkedIn pages thinking, “Darn… I wonder what they’ll do with what I said there?” What are you doing to make sure your members aren’t balking at the information you’re asking for on profile pages? The tipping point for privacy concerns might still be a ways off… but there’s no doubt it’s on people’s minds. “Even though online outreach to voters continues to expand, and Internet fundraising is a major priority for candidates, the Internet is not yet considered a tool that voters can use to gain more political power or influence,” Cole says. Yet they believe this is changing and over the next two election cycles the Internet will become “a major factor in changing the political landscape.” Occupy Wall Street, Occupy LA, Occupy [fill in the name of your organization]. Occupy it online. What are the possibilities here? Threats? How can you get ahead of the potential impact of influencing politics online to benefit your organization’s mission? Is there a part you can play in accelerating this trend? Can you believe online buying is 18 years old? Amazon has flourished and Borders Books has suffered because of it, to cite an example from just one industry. Music CDs have pretty much gone by the wayside as fans download digital files. “Even though purchasing online has already had a significant impact on buying habits, the changes still to come in American purchasing brought by the Internet will no doubt be even more extensive,” says Cole. Are you leveraging online buying trends as fully as you could be? Are you taking orders online but still shipping out print books and manuals? Time to think hard about converting to ebooks…. I’ll digress from the report summary here to mention that ebook readers have satisfaction rates of 60% and higher (up to 75% for Kindle buyers). Kindle books outsold print books at Amazon this past year for the first time. It isn’t a fad. It’s a trend. Don’t be the Borders to someone else’s Amazon. A friend recently recounted his nephew’s description of a college party. “About fifteen people were there. And they were all texting each other. In the same room. My nephew said it was quiet. The quietest party you can imagine. Except for the occasional laughter when someone forwarded something funny or texted something witty. Then there would be a laugh, then another, as the message floated around the room.” Yes. In the same room. Texting each other. It’s no joke, it’s true, and the Digital Future’s report validates it. People are spending more time connected online than they do face-to-face. “But is quality being sacrificed for quantity?” Cole asks. “Will those who use social networking services consider them as alternatives to face-to-face involvement with the people in their lives?” In your organization’s social networking and other online environments, how are you ensuring that quality is overriding quantity? That your members are getting something valuable for their time? That they are able to make the same sorts of strong connections online that they make at face-to-face events? Are you ready for what’s next? “In 2006, YouTube and Twitter had just been born, and Facebook was a toddler. Six years ago, who would have thought that these nascent technologies would become the standard for social communication in 2011? The next major online trend is being developed right now by a new crop of Internet visionaries just waiting to be heard,” says Cole. How adaptable is your organization to upcoming change? Because there will be change. And if I were to guess it would be about personalization. Think about it. You can order M&M candies with any message you want (that will fit their basic specs). You can create your own movies and upload them for the world to see. You can write and publish your own books with a few clicks of the mouse (okay, the publishing part… not the writing part). You can produce your own music and market it to your fans. You can order any number of items with your name or logo on them. And the youngest members of our associations have been growing up in a personalized, customized, all about “me” world for a long time. Okay, glad I got that off my chest. At least you can start with these ideas from the Center for the Digital Future and your pal here at aLearning, right? And it is, isn’t it? Admit it. Well, maybe things seem okay for the moment, but at some point, you’ll experience frustration with a board of directors that you’ll be convinced is off its rocker, in whole or part. They volunteer to run for the board of directors of your nonprofit organization, get elected or appointed, and voila! — they’re supposed to know what’s expected of them. “But Ellen! We have an extensive board orientation program,” you say. You cover the organization’s pertinent documents (bylaws, standing rules, etc. ), mix in the most critical legal stuff (open meetings laws, liabilities, etc. ), spend some time with the financial data, maybe cover some of Robert’s Rules of Order. Everybody leaves with a fat binder and cognitive overload.But nobody leaves having experienced effective training. Stop a second and think about that. You’ve just entrusted major decisions to a group of people based on a binder, a lot of conversation, and maybe a few expert speakers. Board members perform several tasks. Learning those tasks requires learning new skills — or adapting existing skills to new applications. When is the last time your board orientation included practicing performing a necessary task? Or practicing anything? When’s the last time you presented your board members with hypothetical problems of the sort they’ll need to solve? Case studies? Asked them to work together on a simulation? You’re right. You do not want to extend your orientation time. If anything, you want to reduce it. Instead of walking the members through the bylaws, pick a half-dozen key items and create role-playing scenarios so they will experience them. Instead of asking members to sit through a presentation by a legal expert, create a few scenarios based on the most likely litigation you could face. Have members work in small groups to work through what they should do and why. Instead of handing your members a manual on Robert’s Rules of Order and expecting them to magically know the ins and outs of conducting a meeting with them (even assuming they actually take the time to read the manual, which they probably won’t), tell them you’ll be conducting part of the orientation using Robert’s Rules. Instead of handing them a bunch of financial documents and tediously explaining each item line by line, ask them what they think the most pressing financial issue for the organization is, then use the documents to show the current fiscal situation. Ask them what they think the organization wastes the most money with, then use the budget to determine where the most money is spent, and where the least money is spent.Create an online version that includes explanations of those items through call-outs that appear when the mouse hovers over them so they can continue to refer to it even after the orientation session. You probably have even better ideas than these to introduce more effective training techniques into your board orientation — the point is to involve them actively in the materials they will be using as board members. Get them thinking like board members through case studies and scenarios and small group discussions. Help them begin to behave like board members by modelling and practicing Robert’s Rules of Order (or other meeting management techniques). We expect our children’s teachers to be trained in classroom management. We expect our doctor’s office to know how to keep our medical records straight. We expect our attorneys to have the answers to our questions. Why should our board members be any different? You wouldn’t want your children in a classroom where the teacher was given a week’s series of lectures and handed a binder then considered ready to do the job. If you’ve had a car accident, you wouldn’t want your insurance agent showing up in his pajamas complaining you interrupted his favorite daytime TV show, would you? of course not. You expect that they’ve been properly trained so you will get the service you expect from them. …leading to the very dysfunction you really, really, really don’t want permeating your board.